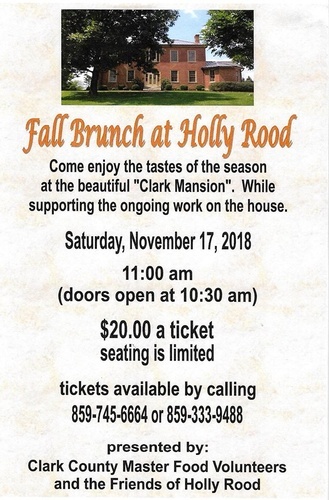 The Clark County Master Food Volunteers and the Friends of Holly Rood present an Autumn Brunch at Holly Rood. 28 Beckner Street Winchester Ky. The cost is 20.00 a ticket for a semi-formal brunch prepared by the Master Food Volunteers and served by the 4H Leadership. We will be using thechina and crystal bought by the original members of the Friends Of Holly Rood over fourty years ago.The house is beautifully decorated for this autumn occasion. Proceeds will be used to replace the 40 year old upholstery and paint in the parlor. Tickets available by calling 859-333-9488 or 859-745-6664.